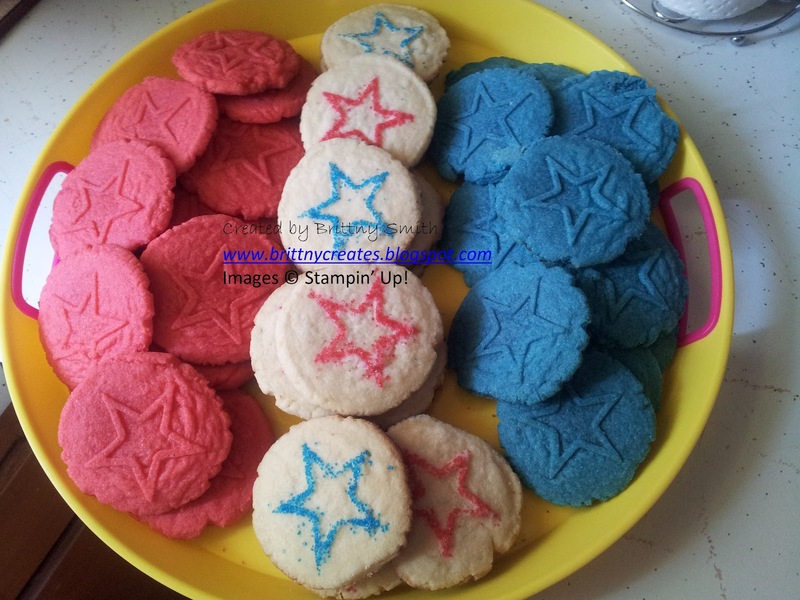 As soon as I saw that the new Sweet Pressed Cookie Stamp Set includes a star, my mind was already thinking of making red, white and blue cookies. Back in May, I wrote about a jello cookie recipe I found on Pinterest that worked with these cookie stamps and tasted great. You can read about my grape cookies and get the recipe HERE. Since we were going to a picnic where a lot of people and kids were going to be there, I had the perfect reason to make all these cookies! I knew I was going to use the jello recipe to make my red and blue cookies. I used strawberry for red and blueberry for the blue cookies. The white cookies are the sugar cookie recipe that comes with your cookie stamps. I just love how they came out and they definitely taste like strawberry and blueberry. Love having these stamps and this recipe in my book! Stampin' Up! now offers three sets of cookie stamps that you can order for $16.95 each. You are going to love these stamps. They are so easy to use and makes a great project for kids to help in the kitchen. I had my 2-1/2 year old help press the stamp onto the cookies and he was so excited to see the star when we lifted them! They also make great gifts that ship in a box ready to be wrapped and given to someone who loves to bake. Interested in these sets, head to my store at www.brittnysmith.stampinup.net.